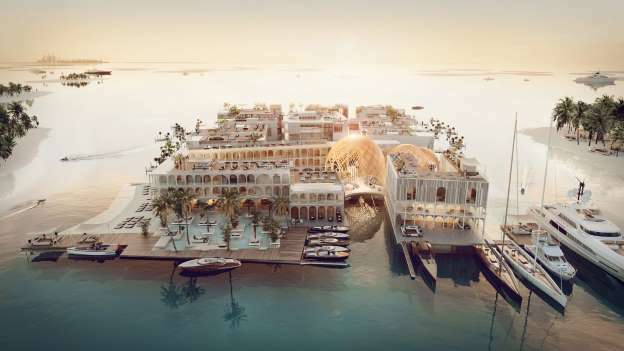 Dubai, the glittering city of superlatives, has announced plans to build the world's first underwater luxury resort, modeled after the mystical city of Venice. To be located 4km offshore from Dubai's mainland, the USD$680 million (C$827) Floating Venice will recreate the city's labyrinthine alleyways, canals and main square, Piazza San Marco, in the form of a luxury resort that will be able to accommodate up to 3,000 guests. While the laundry list of specs is impressive, the resort centerpiece is its underwater deck which will offer guests panoramic views of sea life via clear acrylic panes. To beautify the underwater scenery, more than 400,000 square feet of corals will be planted around the resort to promote the growth of marine life and coral reefs. The underwater deck will feature guest cabins, pool, restaurants and what's being billed as the world's first underwater spa, all of which will offer unobstructed views of their watery surroundings. To lend an air of authenticity to the Middle East's version of Italia, gondolas will be imported straight from Venice to be used to ferry guests to their cabins. Overall, the resort will feature 414 cabins spanning four decks, along with artisanal shops and boutiques and a dozen restaurants and bars. The property is being developed by the Kleindienst Group, which is also behind The Floating Seahorse, the world's first luxury underwater living experience. The Floating Venice is expected to be completed by 2020. If you can't wait that long, there's always the Ithaa Undersea Restaurant at the Conrad Maldives Rangali Island which serves dinner 5m below the surface, with 180-degree views of their coral gardens.